Can Holyfield Jr emulate his dad? BBC Sport speaks to four-time heavyweight world champion Evander Holyfield and his 17-year-old son Evan, who hopes to follow in his father's footsteps. 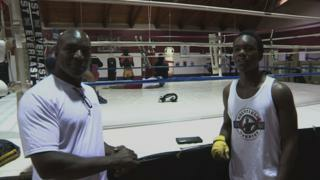 In between training Evan reveals what it is like to be the son of a boxing legend while Holyfield Sr gives some fatherly advice on how he can be a success in the sport.